Monterrey Castle is located in Verin in the autonomous region of Galicia, Spain. The population of the municipality is 14, 433 people. Verin is a city known for farming. It produces excellent wine and there are three stations for bottling mineral water. Carnival in Verin is one of the most original in Spain. During the carnival, a procession passes through the streets with masked figures, brandishing whips and making an interesting sound with bells tied to their waist. The carnival is very similar to the Brazilian carnival. The main tourist site in Verin is Monterrey Castle - this is a huge complex, a distance about two miles outside town. Monterrey Castle played an important role during the Spanish war, and is strategically built on the border. 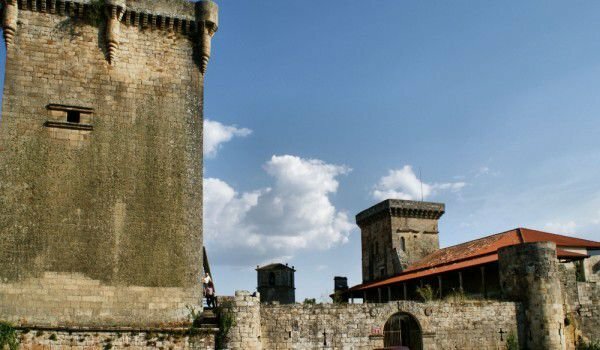 Monterey is more than a castle, because it includes a monastery, hospital and a small town that was abandoned in the nineteenth century. The castle itself is more impressive from afar than up close. At night the castle is lit and can be seen even from neighboring Portugal. Monterrey Castle was built in the twelfth century by Alfonso Henríquez. In the sixteenth century the fortress was used by Phelippe el Hermoso. The castle is built of stone and is very stable. The castle played an important role for Pedro I the Cruel. The two towers of the castle - Lady and Keep were built in 1482 by Sancho Sánchez and offer an incredibly beautiful view.